Is the car in the foreground a Ford Pilot or a Lanchester Ten? Hi, It’s an Austin ten. My abiding memory of the Old Steine is when returning with my Mum after a few days in the Royal Sussex County Hospital, probably around 1956 or 57, the conductor called out “Old Steine, Stein or Stain”. To me as a 7 or 8 year old at the time, it was hilarious. It sounds a bit mute nowadays though! Whilst I can’t make out the registration number, I would strongly suspect that the bus on the right is one of the “CAP” registered Bristol K double deckers delivered new to Brighton Hove & District in 1940. Because the Eastern Coachworks factory in Lowestoft, where the bodies were built, had been evacuated to a safer location, these vehicles were delivered incomplete, with BH&D finishing the job themselves. 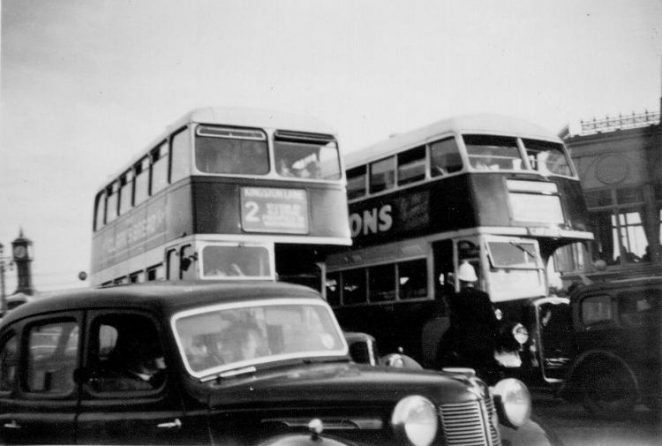 Most of the CAP batch of buses were converted in the early 1950s to convertable open-toppers, with roofs that could be removed in the summer for use on seafront service 17, and replaced in the winter for use on other routes. Yes, I think the number plate is above the cab, and seems to read “CAP …”. The bus has been slightly updated with a post-War longer Bristol radiator. The Brighton Hove and District company inherited the Holland Road coachworks from Tillings, but this was destroyed by fire at some point. Yes, the vehicle on the right is certainly one of the CAP registered Bristol K’s dating orginally from 1939. In fact it is CAP 229 which was the only vehicle of this batch treated in this way in the early 1950s before being fully rebuilt to a convertible open-top. The bus still exists after a life of nearly 70 years and is in my care gradually being restored back to its 1950s condition in cream livery and complete with its roof. One day hopefully it will return to Brighton. I would suggest that the car in the top photograph with the busses is a c. 1947 Austin Ten (1125cc side valve). Main clue to this assumption being the distinctive Austin winged badge on its front. Talking of buses on a Sunday, just over fifty years ago there would have been at least four trolleybuses lined up at the Old Steine terminus of routes 26, 26A, 43, 36, 46A and 48 at any one time, plus possibly trolleybuses on routes 41 or 42 clockwise also stopped there. On weekdays there were many more of these non-polluting electric buses waiting to leave to pick up passengers at Electric House and beyond. Today there are practically no buses which terminate or even stop at the islands on the Fountain side of the road, except for the occasional tourist or express coach looking for a parking place. Looking at this picture reminds me of something, the police wore white helmets in the summer? Why, were they cooler to wear or something? Hallo David. White helmet, white gloves I seem to recall. Very smart. Perhaps Andy Grant or Roy Grant our regular historians could tell us why. I suspect it was for coolness.